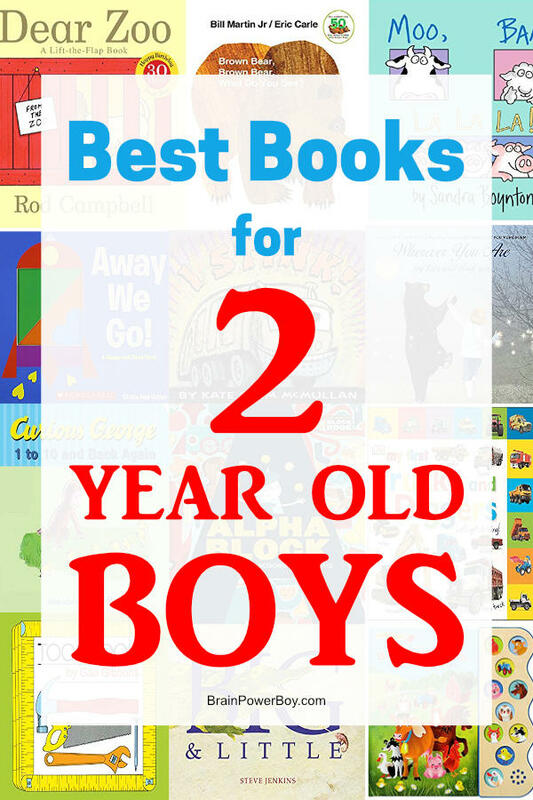 I narrowed down the best books for 2 year old boys to these wonderful choices to make it easier for you to find the best book for your little guy. This is the book list you need! I have a lot of experience in selecting books for boys. Not only am I a boy mom with a blog that has extensive posts featuring books for boys, but my husband was a librarian, I worked in libraries for years, I ran a boys book club, and my library of books when my son was growing up was . . . well, huge! Do see our book lists for boys after you read through this post. We have a lot of great lists. Two-year-olds are so much fun to read to. Many love snuggling next to mom and reading for a long, long time. Others enjoy listening to stories, but have to be on the move while doing so. Still others do a combination of the two and sit for a while, then wander off to get something and come back. Allow them to experience reading how it fits for them. Right now your 2 year old is learning about what books are, and how they work. They enjoy seeing the pictures and may be interested in the words and start asking what they say. They also really like rhyming and onomatopoeia. Your boy(s) are recognizing words on the page and that they mean something. By reading to them, you are increasing their vocabulary. Even if they are not yet vocalizing the words, they are learning them and learning what they mean. As you read books to them, you can point out colors, objects and single words throughout the books if they interested. If the text mentions that the boy threw the ball, you can stop and talk about the ball. You can also, show him his ball. Obviously, you don’t want to break up the story constantly by doing this but it is good to do so they can make connections between what they are seeing in the book and what they can see and touch in real life. One of the cutest things you may see is your little boy sitting reading a book and babbling away as though he is reading. Sometimes the book is even upside down (too adorable 🙂 ) They are certainly starting to get the hang of what reading is about and are enjoying the process. Be sure you have plenty of books for them to read in your house. The more the better! Libraries are great, and we use them a lot, however do make sure they have their own books as well. The repetition of reading their books to them again and again is important and helps them learn. Typically, they say that older two-year-old boys know about 50 words or so. Reading will help them expand that number. I made time for reading multiple times a day. It was a very big part of our lives at this age and as my son grew up. This is the perfect time to get into the habit of reading with him and building beautiful memories of reading together. While I do think that by age book lists miss things because the most important thing to keep in mind is your boy’s interests, I do not want you to miss some of the best books out there. So, I made these by age book lists. I also made them because so many asked for them. With boys age 2 we want to start to build the experience of reading as a positive and enjoyable activity. Do keep in mind that if he doesn’t care for reading a certain book, move on and bring it back another day. Sometimes they need to see something quite a few times before they want to try it. We want to raise a reader, not just make them read random books! It is all about the joy of reading. I have somewhat split this list into two section of fiction and non-fiction. I will be adding to this list as I find more books that I feel are worthy of adding in. I’m a bit fussy, so it does take me ages to write these book lists. If I say the best, I make sure they really are the best books for this age group. 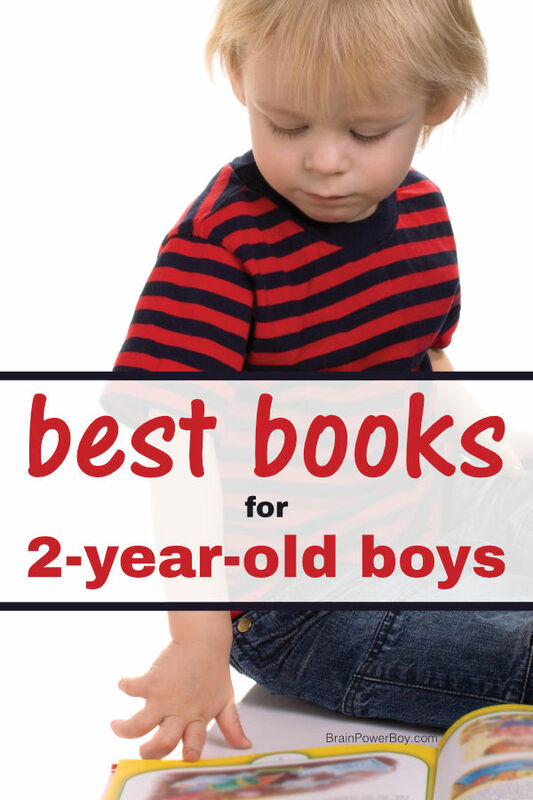 Below are my choices for the best books for your toddler boy. The books in each section are not in a particular order. Simply go through and see which ones will be a great book to read to your toddler boy. There are a lot of books to choose from, so be sure to revisit this list for more ideas soon. Such a fun and amusing title, Good Night, Gorilla will be a hit with your boys. A zookeeper goes about his business of closing up the zoo for the night but as you can see from the picture, the little gorilla nips the key and causes a few issues! I am sharing another zoo themed book because I couldn’t choose between the two! Dear Zoo is a lift-the-flap book. In this favorite among many, the zoo sends a pet in a package. When kids lift the flap they see the animal that the zoo sent. Will the child getting the packages end up with the perfect pet? Toddlers will enjoy lifting the flaps to see the animals. Be sure to make a lot of animal sounds together! From the first time I read a Sandra Boynton book, I was hooked. She has a way of writing very simple books that have so much appeal to kids that they want to read them again and again. Not only are her illustrations fabulously inviting, but her rhymes and simple story-lines never disappoint. Moo Baa La La La is one of our favorites. There are a lot of opportunities for both of you to make the animal sounds in the book and they will enjoy telling you that pigs go oink, not la la la! This classic is over 50 years old. Can you believe that? In true Eric Carle style, the illustrations make the book interesting for boys to look at. The text with its rhythm also plays into why this book is so popular. I’m sure many of you are familiar with it already, but it deserves a place on this list because it is just right for this age. They will notice the purple horse. Are horses really purple? They will enjoy seeing the faces of the children, and they will like remembering what animal comes next. When it is bedtime and your little one really doesn’t want to go to bed, a great way to settle down is with a bedtime story little guys will absolutely love. Goodnight, Goodnight, Construction Site is that book. The rhymes in this book help a child say goodnight with all of the construction vehicles they like, such as a crane, excavator, and dump truck. The images are both realistic and cartoon-like at the same time. Yes, you may have to read it more than once a night, it is that kind of book, but you will all enjoy doing so. With a book named HUG, you know there will be plenty of opportunities for snuggles. Bobo, the little monkey, really wants a hug. And, he tells his friends the elephants, and he keeps saying hug as they go past a lot of animals. Until, he gets just what he needed. This is a rather short book with a sweet ending. Simple but endearing. One of the top dinosaur books for young boys, Dinosaur Roar is so much fun! There are a lot of different ideas presenting in this rhyming book. Weak, strong, big, small, short, and long and more, as well as plenty of colors, and scenery to look at. It is a sure winner for boys who like dinosaurs and even those who are not yet obsessed. This book is just right for those who like trains. Freight Train has plenty of details to keep your boy happy. Not only does it name the cars in the train, but also mentions the colors as well. This book is enjoyable to read, and is a language and vocabulary builder as it gives the proper name for all of the items shown. I am rather fond of interactive books including sound books. I found this little gem a while back. One would think from the illustrations that it was an old book with its charming old-fashioned illustrations, but it is actually relatively new. The story is of a lost little pig and the farmer driving around the farm to find him. As he goes along he sees all of the animals. Your boys will get to learn the different sounds the animals make. It is also like a mini matching game as there is a round circle with the animal’s picture in it within the story indicating when the child should press the button for that animal. Roger Priddy has written a lot of wonderful books just like this one. So don’t skip this entry if your boy is not into dinosaurs. I’ll list a few other good ones after I explain why these are so great. Trust me on this one, kids love these books! I chose My Big Dinosaur Book to highlight but he also has trucks, trains, animals, farm and more. See the other titles here. They are all excellent! Some boys, not all, absolutely love books that mention stinky, smelly things. They love the words stinky and smelly and they enjoy giggling about stinky stuff. If you have one of those boys, or if you have a boy who is curious about garbage and likes vehicles, I Stink might be just the book for him. This is another title where there are several good books like this in the series. Little boys usually love fire engines. This book is just right for those who do. Be sure to plan a trip to the fire station so they can see the big engines up close and personal – and maybe even get to sit in one! DK is definitely a publisher to be on the lookout for as your boy grows up. They are a big favorite of mine. In Touch and Feel Fire Engine, there are nice color photographs. They will see fire engines, fire fighters, equipment and more. One example of the touch and feel aspect is the tires of the engine with their rubbery feel. I am slipping some concept books into this area because there are not a whole lot of non-fiction titles for 2 year old boys. If this book had been available when my son was younger, I would have bought it for him. I still might buy it because I just love it! With charming illustrations, cut-out letters, and a guessing game as well, Alphablock is a winning alphabet book. Each letter hides the actual item that matches the letter and there are hints as to what the item may be in the illustration. This is a big thick chunky book. The cut-out letters can be felt and traced with their finger. Alphabet books like this are also great because after reading them many times your child will start to remember what is behind the letters. My feeling on this one is that it is a top notch book! I read this book so many times that for a long while I had it memorized! Opposites is my favorite opposite book. And believe me it is always hard for me to choose just one. However, this one is just so good! Sandra Boynton’s illustrations are always a treat and her books are funny. In Opposites, when she talks about the concept of “in and out” she shows a turtle in his shell and another amusing one out of his shell. Super cute! I use Gail Gibbons books in some of my book lists because she is rather good at presenting basic information about a topic in a way that is both interesting to the child but also in a way that helps them to really understand the topics. She also has some books for younger children. They are not as detailed but are still just right for learning about a subject at this age. Here in Tool Book, she shows many tools. Says that “tools help us build” and shares how different tools do so. This is a nice overview of tools. I would say that if your boy is curious about how things are made, or has someone in his life that uses tools, this one is a must have. In First 100 Words, he shares a simple object and simple text. The book is broken down into different sections, such as things that go, or colors and then within that section are pictures with one or two words. In each of my lists I try to add one of these types of books whether it be a dictionary or an encyclopedia or in this case a book with a child’s first 100 words. Build up your library! Having these books on hand is important and will help your child immensely. This is the perfect one to start with. This tabbed book is not only wonderful for your boys to look at but I really like the tabs! They are nice for fine motor as are books in general. Five stars on Amazon is not that easy to get and My First Trucks and Diggers (at the time this was written) has a 95% positive rating! Older two-year-olds will really love this one. Full color picture, fun text and a whole lot to look at make it a really great book to get for them. It really isn’t too soon to start sharing books with numbers. I know many of these books are written with preschoolers in mind but toddlers not only enjoy them but they also get a lot out of them. Curious George 1 to 10 is a super introduction to numbers. Not only is Curious George a lovable monkey that they may already be familiar with (if not, grab this!) but it covers 1 to 10 and then goes backwards from 10 to 1. With a lot of boy friendly pictures, this shape book is a hit with the little ones I know. There is a spaceship, trucks of various types, a sailboat, motor cycle, helicopter, police car and more. See?! Perfect. Each shape is cut out and there are at least a couple examples. Away We Go! is a pretty neat book! The fascination with big and little is strong in young boys especially when it comes to themselves and to animals. Steve Jenkins is another author you will see in my lists because of his illustrations and the overall quality of his books. Try Big & Little! I’m sure they will enjoy it! I am adding this in here because two was the age my son was when we started reading this. Keep in mind, I like real. So I didn’t get a modified Mother Goose that is politically correct and changes many of the rhymes to be gentler and, honestly, diminished. There are a few modifications in this one as well but overall it stays pretty true to the originals. If you too want as close to the real deal as you can get in print right now, then this is the book to add to your boys library now. We read it for years are years. The Real Mother Goose is full of nursery rhymes you will remember from your childhood days, and a few you may have never heard before. If you want something more tame, try Richard Scarry’s Best Mother Goose Ever. It is great as well. I am going to end this list with an extra special book for mothers and sons. (I have a whole list if you are looking for more mother son books as well! I love this book. I love the illustrations, the style, the words and everything about it. It is all about love and that shines through. This is a book for mothers and sons to read together. It is about a mother’s love and how no matter where they go, that love will be there. This is the perfect time to make sure they know this. You can read it to them every year on their birthday, even as they get to be in their teens. If you get emotional, be prepared to get teary-eyed. Especially as your boy gets older. This one is a keeper! 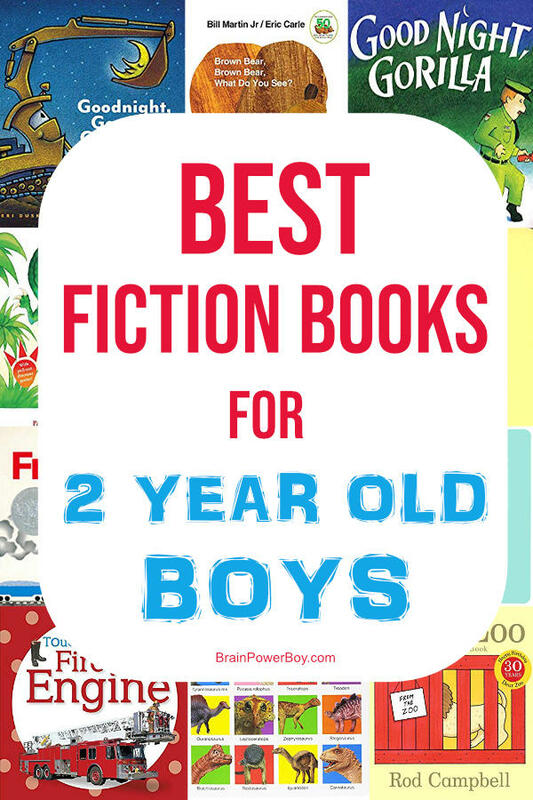 I hope you have enjoyed this book list of the best books for 2 year old boys. I really enjoyed pulling it together for you. I take my lists very seriously, so they take me so long to write. If you and your boy enjoy a few books from this list together it will have been worth my time and I sincerely hope you do. I do add to these book lists over time so feel free to check back. If you need any suggestions, do feel free to leave a comment or contact me. I am more than happy to help you find just the right books. 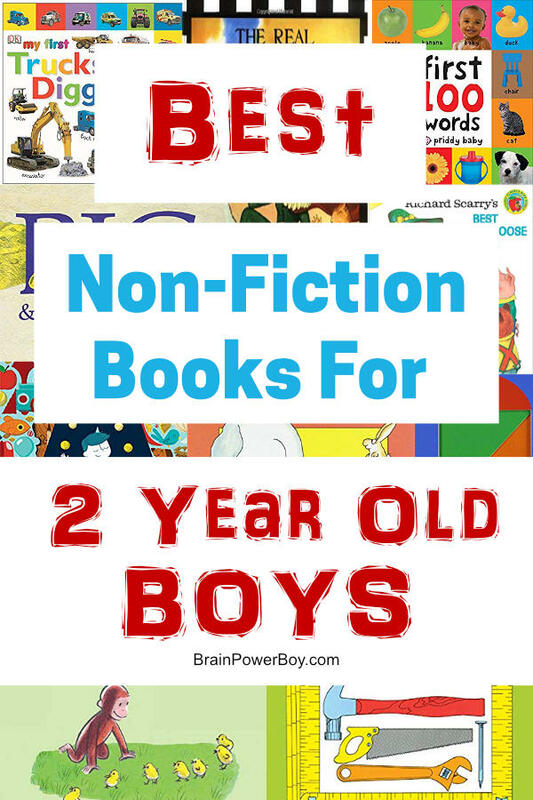 Best Books for 3 Year Old Boys as there may be some in that list that will work for you as well.